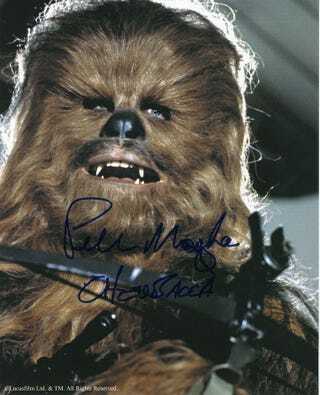 If things had turned out differently, Peter Mayhew could have played Bigfoot, adding to a resume that already included the coolest Wookiee in a galaxy far, far away. Sean Whitley, writer and director of Southern Fried Bigfoot, explains. While shooting Return of the Jedi in the redwood forests of Northern California, Peter Mayhew, the seven foot, three inch actor who portrayed Chewbacca the Wookiee, was warned not to walk off set in costume for fear of being shot by hunters. "Remember, this is Bigfoot country," he was told by concerned crew members. Coincidentally enough, Mayhew was attached years later to the title role in "Bigfoot," a film that was written by Mark Hanson and was to be directed by Brad Keller of Texas-based Fireside Entertainment. The film was in development from roughly 1999-2001. Hanson says he picked Bigfoot as the subject matter out of "pure fascination." Likewise, Keller says that "Mysteries always excite me." The project required both to do a bit of research, and they even consulted with Bigfoot buffs, including members of the then-titled Texas Bigfoot Research Center. Hanson adds that Bigfoot researchers "came out of the woodwork once it was known we were working on a movie" about the subject. According to Keller, the film's plot centered on Bigfoot being "the missing link between man and aliens from another world." "Missing Link" was also a potential title for the film, and during appearances at memorabilia and science fiction conventions, Peter Mayhew referred to the project as "Bigfoot Among Us." In a blurb from a 2001 issue of "The Star Wars Insider," Mayhew referred to the film's tone as being in the same vein as "The X-Files." As for how Keller and Hanson managed to get Mayhew interested in the title role, Keller recalls "I approached him at a party and he was interested in playing the part." Peter Mayhew photo via Lazze X.
Keller and Hanson shot a trailer for the film in the woods of East Texas. Shooting was planned to take place in both Texas and Louisiana, and casting notices appeared in regional newspapers such as "The Dallas Observer." Hanson recalls that they were "told by a studio we had a deal." Nine years later, Hanson says they're "still waiting on the deal; I quit holding my breath, though." While the film never ended up getting made, Keller says he'd "still like to make it if funding can be raised." As for Peter Mayhew, he got the chance to don another hairy, bipedal creature suit for "Star Wars Episode Three: Revenge of the Sith" which was released in 2005. Special thanks to Brad Keller and Mark Hanson for sharing their recollections. This post by Sean Whitley originally appeared at Cryptomundo. Sean Whitley is the writer and director of "Southern Fried Bigfoot," which is currently in broadcast rotation on The Documentary Channel.